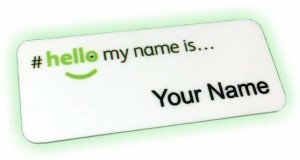 Why choose plastic name badges? 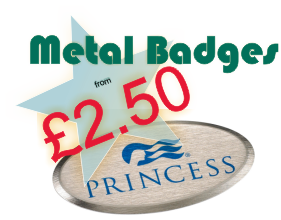 If your looking for the lowest priced name badges then our plastic name badges are our cheapest option and represent fantastic value for money. 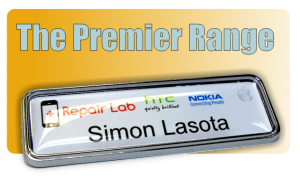 Our plastic name badges are made from high quality FRP (Fibre Reinforced Plastic) which is commonly used in the aerospace, marine and automotive industry and is extremely durable and virtually indestructible under normal use. 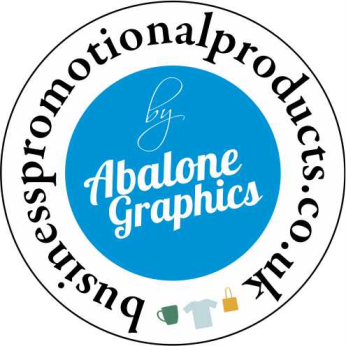 The face of the undecorated plastic badge is bright white and glossy in appearance and as with all our name badges this can be printed in full colour and can feature any logo or text, including individual names and job titles. The term printing is somewhat misleading as our plastic name badges aren’t actually printed, but are produced using an innovative process involving specialised dyes, pressure and heat. The name badge designs are reproduced using specialised dyes and paper, and then using intense heat and pressure, the dye is transformed from a liquid form to a gas that permeates the plastic name badge. Once cooled the dye solidifies leaving a durable permanent image. This process is so effective if you look very carefully at the sides of a full colour plastic name badge you can actually see that the dye has penetrated way below the surface layer of the badge. This is far superior to printing directly onto the name badges as the image cannot be scratched off and is much more hard wearing. 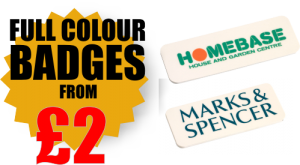 Plastic name badges we believe are the perfect choice where function and cost are both key, allowing you to have a full colour name badge completely personalised with a magnetic fixing at an incredibly low price.